The temporomandibular joint, or the TMJ, is located on either side of the head and connects the lower jaw to the skull. If you place your fingers in front of your ears and open your mouth, you can feel the TMJ in action. This area may feel tight or sore on occasion, but for people with TMJ problems, it can feel painful all the time — particularly when eating or speaking. 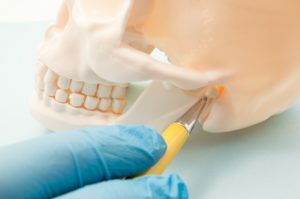 Dr. Samir Ayoub of San Francisco Aesthetic Dentistry is an authority on TMJ problems and offers a range of treatments to give people relief from the painful symptoms. Read on as he explains more about what the TMJ is and how to treat problems that affect it. Arthritis damages the cartilage of the jaw joint. Blunt force to the face damages the jaw joint. Chronic teeth clenching or grinding erodes or dislocates the disc. TMJ problems can cause various symptoms, most commonly pain and tenderness around the jaw joint. Other symptoms of TMD include locking jaws, limited range of jaw motion or clicking or popping noises when opening the jaw. TMD can also change how the upper and lower teeth fit together. Some cases cause tinnitus (ringing in the ears), ear pain and pain radiating from the jaw to the rest of the face and neck. If you are experiencing symptoms consistent with TMD, you should see a medical or dental practitioner like Dr. Ayoub that has experience with these kinds of issues. He will perform a thorough examination and some testing to determine the source of the problem. If Dr. Ayoub diagnoses you with TMD, he will review your treatment options. Often, simple lifestyle changes such as applying ice or heat to painful areas — or eating soft foods while limiting excessive jaw movement — can help. Over-the-counter or prescription medication can reduce inflammation, and massage and stretching exercises may also help. Other treatment options may include wearing an oral splint or bite guard at night to keep the teeth in the proper alignment and prevent tooth grinding/clenching, or adjusting the bite with orthodontic treatment. To schedule an appointment with Dr. Ayoub and discuss any pain or symptoms you are currently experiencing, please call or email our practice today.